Lenovo’s Moto Z family came at a time when enthusiasm for modular smartphones had yet to dwindle. The company made a bold promise to support their Moto Mods for three generations. This long-term strategy has seemingly paid dividends as more and more interesting modules have come out for the device since, including smart speakers, projectors, gamepads, and camera attachments. With only a few months left until we see what the Moto Z3 and Z3 Play have to offer, we bring you a new set of leaks that cover most specifications and software features. XDA-Developers has been shown an internal Lenovo document detailing the hardware and key features of the Moto Z3 Play, and we can vouch for its validity. While this is still an early leak and some of what’s shown here might be subject to change, we expect most (if not everything) mentioned here to eventually make it to the Z3 Play in particular, and perhaps the Z family in general. Some of these details also align with and expand upon previous leaks, so we are confident that the information in the internal document is correct. According to the internal document we were able to inspect, the Moto Z3 Play will be sporting an aluminum body with 2.5D Gorilla Glass at the front for slight display curves. The document also calls the phone “one of the thinnest premium smartphones in the market,” a statement that probably explains the fact that the Z3 Play will only boast a 3,000mAh battery. 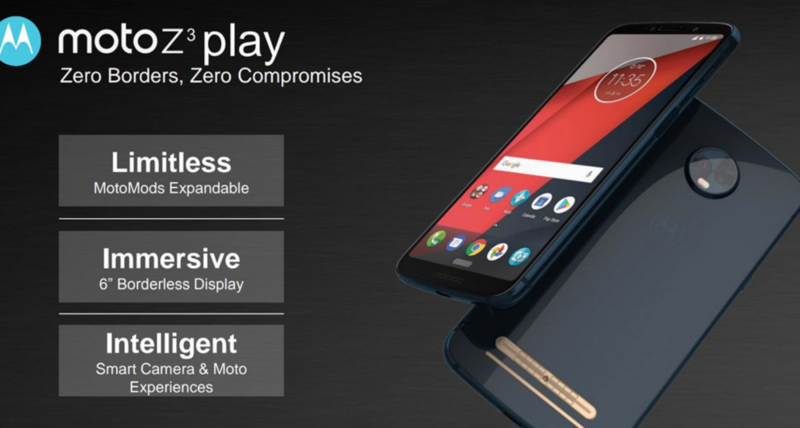 While this remains a departure from the beefy battery capacity that gave the original Z Play its great reputation, the Z3 Play will support Moto Mods, meaning you’ll be able to access battery-boosting modules. As expected, the Moto Z3 Play will also pack in the Snapdragon 636 processors, as well as 4GB of RAM with 32GB and 64GB of storage options, and microSD support. The front of the device will host a “virtually borderless” 6-inch 18:9 “Max Vision” FHD+ AMOLED display, bringing the Moto Z family up to speed with the latest trends in the premium smartphone segment. This presumably means smaller bezels, as suggested by previous leaks, though they’ll have different budget considerations than other OEMs given they still need to support Moto Mods. For the camera, the device will bring a 12MP low-light sensor in a dual camera array, and an 8MP front-facing camera. Previous leaks have suggested that the Moto Z3 Play will not feature a headphone jack and none of the documents we’ve received make reference to one. Moto Display returns, and the company will be adding “Moto Experiences” for smarter and easier shortcuts to the features one uses most — this seemingly aligns with previous leaks about “Moto XP’s.” Moto Voice will take advantage of four noise-canceling microphones built into the phone, and it’ll get the ability to “use voice commands (…) to control your favorite apps” and get answers to multi-part questions. The navigation gestures featured in previous Moto devices will also appear on the Moto Z3 Play in the form of “one simple bar”, and interestingly enough the company has opted for a side-mounted fingerprint scanner , adding face unlock as well. The device will offer TurboPower charging once more, promising “half a day’s power in half an hour” (which oddly sounds like a weaker version of the Dash Charge slogan). The camera of the Moto Z3 play will offer a variety of features, including what the company calls “cinemagraphs,” Lenovo’s take on live photos that keep a part of the shot animated for a cool effect (similar to the Samsung’s S9 & S9+ feature). It’ll also offer a variety of other creative effects to add to one’s pictures. Portrait mode will be present on both the front and the back cameras, with the rear setup using both sensors for clearer depth-mapping and edge-detection. Another neat feature is called spot color, which lets you pick one color in the photo and turn the rest of the picture black-and-white, similarly to the aesthetic of the famous Sin City movies/graphic novels. Then there’s cutout mode, which lets you snap a picture and replace the background with whatever image you want. The camera will also be able to scan text from documents or business cards, and allow you to either copy it or export it to a file. On top of all of this, the Moto Z3 Play will let you adjust a variety of camera settings with a sort of manual mode, so you’ll be able to fine-tune focal length, white balance, shutter speed, ISO and exposure through slider bars. Update 5/26/18: We have been shown additional images of a “5G Moto Mod” for the device. The images can be viewed in our follow-up article here. That’s everything we know about the upcoming Moto Z3 Play so far. We expect some of these features to all make their way to other upcoming Moto devices, so we’ll let you know if we hear any more details. Stay tuned to the XDA Portal for more leaks and in-depth device coverage! Check out XDA’s Moto Z3 Play Forums! Mario developed his love for technology in Argentina, where a flagship smartphone costs a few months of salary. Forced to maximize whatever device he could get, he came to know and love XDA. His passion for Android turns into obsession the moment he finds a new wakelock or sees a stutter. Whenever this happens, he feels compelled to fix the issues learning something new in the process.